For long time I had a dream to spend a weekend in an ocean side resort and enjoy with my family. Finally my husband gave me a surprise on president’s day long weekend and we went to a resort in a place called Palos Verdes near Los Angeles. After spending those pampering days, when we came back on Monday and we had a get together with some family friends at our residence. This time I cooked some new stuffs and taken photographs but there were no time to write the recipe and share with you. Starting this week I am slowly coming back to my old routine and hope would be able to maintain the pace. Today I am going to share a yummy snack, a popular street food of Calcutta and eastern part of India. If you visit the city, you would find hundreds of road-side vendors are selling this kind of snack. The formal name of this dish is Chicken Croquettes, commonly known as Chicken chop or chicken cutlet. 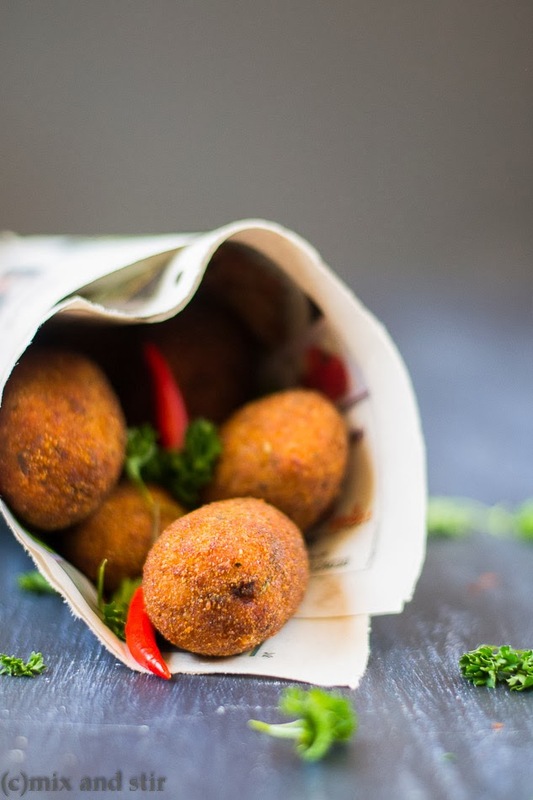 The word Croquette has come from the French word "Croquer" that means to crunch. 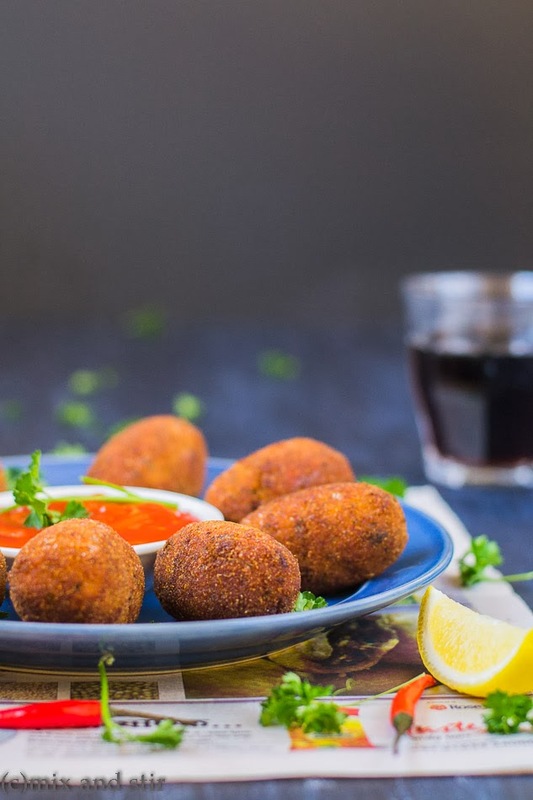 Croquette is a small deep fried food that usually contains mashed potatoes or ground meet (goat, beef, chicken or turkey), fish, cheese or vegetables as filling. 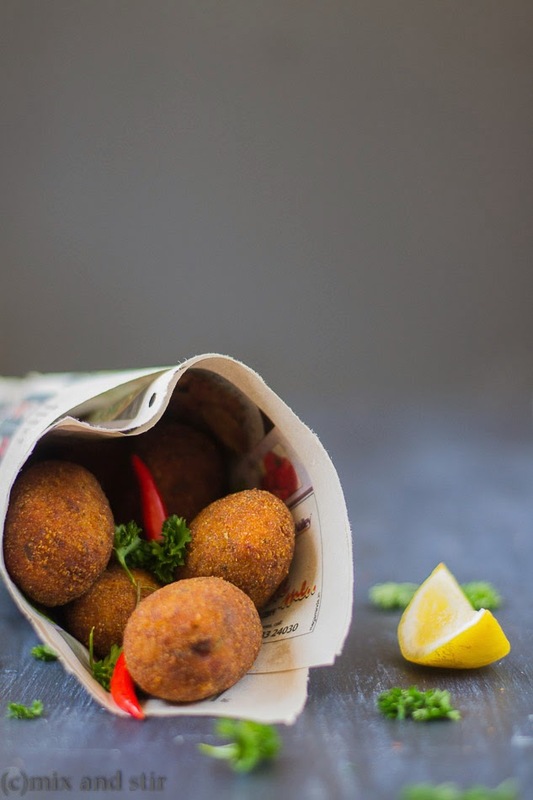 The Croquette is usually shaped like a cylinder, disk or oval shape.First dip the filling in egg wash, roll in bread crumbs and finally deep fry in hot oil. If you want to avoid deep-frying, you can bake them too at oven. The Bengali version can be of different types, both veg and non-veg. Potatoes, mixed vegetables, banana flowers are very commonly used as a filling when it is vegetarian. On the other hand fish (macher chop), minced mutton (mansher Chop) are very popular as non-vegetarian croquettes. 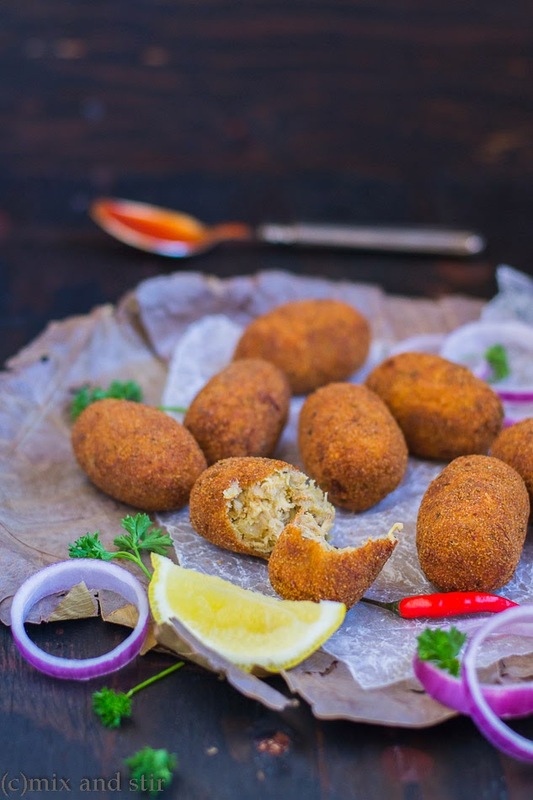 Whether it’s veg or non-veg, each variety of croquettes has a distinctive taste and texture. Once they are cooked, become quite crispy on the outside but remains soft inside, very tempting as an appetizer or a party snack. Generally it is served with tomato ketchup or with your choice of dip and with onion rings and some salads. 1. Take a big pan, heat it up and add 2-3 tablespoon oil. Once oil is hot, add cardamoms, cinnamon stick, cloves to it. Once they are fragrant, discard them from oil. 3. Add coriander powder and green chilies. Stir it and mix it, till oil starts separating from the sides of the pan. 4. Add the boiled and shredded chicken. Mix it nicely with the spices and keep stirring for 4 to 5 minutes. Add the potato, smashed it with a spatula and mix well with chicken-spice mixture. 5. Give some stirs, until the mixture is well combined. Check the seasoning, add salt or chilies if needed. Turn off the gas, now filling is ready. 6. Divide the mixture into 10 equal balls, give them shape like a cylinder, disk or oval. 7. In a small bowl, whisk the egg with 2 tablespoon of water and on an another flat dish, spread the breadcrumbs. 8. Take a ball first dip into the egg mixture, then roll it on the breadcrumbs until it gets a nice coat all over it. Do the same process for the rest of the balls. 9. Now take a deep frying pan, add oil and heat it up. Once oil is ready, deep fry the balls in two batches on medium-high heat until they are evenly golden brown on both sides. 10. Take out them from oil and place it on a paper towel to absorb the excess oil. Chicken Croquettes ( Bengali Style Chicken Chop) are ready to serve. Serve hot with tomato ketchup or with your choice of dip and with onion rings and some salads. The same recipe, you can try with minced goat meat, or beef or lamb. Gorgeous pictures ! 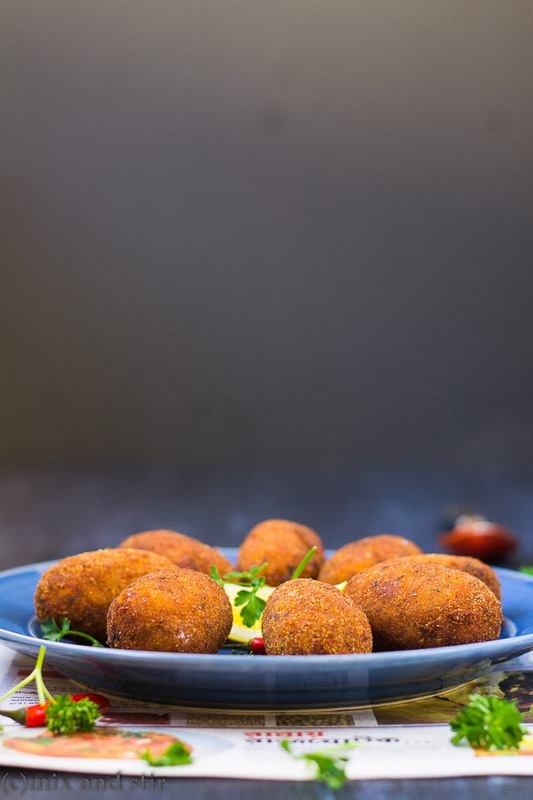 Love your recipe - I never made chicken croquettes, your recipe seems easy enough to try my hands on! that looks fantastic, such gorgeous pictures! 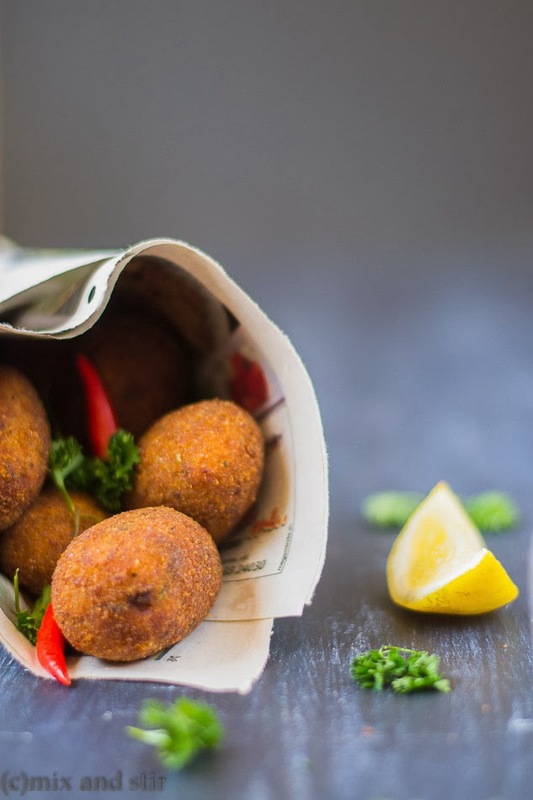 Your croquettes look very delicious! Japanese has croquette too but usually with potatoes and ground beef. I would love to try your version sometime soon! Your pictures are beautiful!!! !